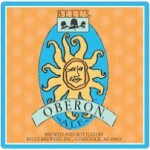 Bell’s Oberon is a wheat ale fermented with Bell’s signature house ale yeast, mixing a spicy hop character with mildly fruity aromas. The addition of wheat malt lends a smooth mouthfeel, making it a classic summer beer. Copyright 2013 The Daily Growler.